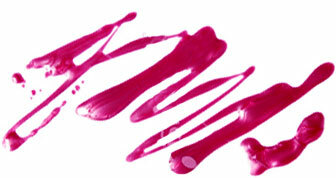 We partnered with essie cosmetics to bring you a month of pink-theme nail art during Breast Cancer Awareness month. Every day thoughout October, we'll reveal a new pink manicure. If you're feeling crafty or clever, you can win the entire essie BCA collection by naming our manicures or sharing your own pink mani. Follow us on Twitter @BeautyBlitz or check back daily for more details. This quick and easy manicure looks like shattered glass on your nails. All you need is some confetti-type glitter. We got ours at a local crafts store. Gently tap on the confetti while your nail polish is still wet and you've got yourself a lovely, 3-D manicure. -essie polish in Plumberry as a base.